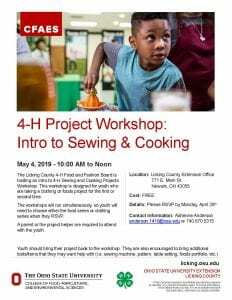 Saturday, May 4, 2019 from 10:00am to noon at the Licking County Extension Office. 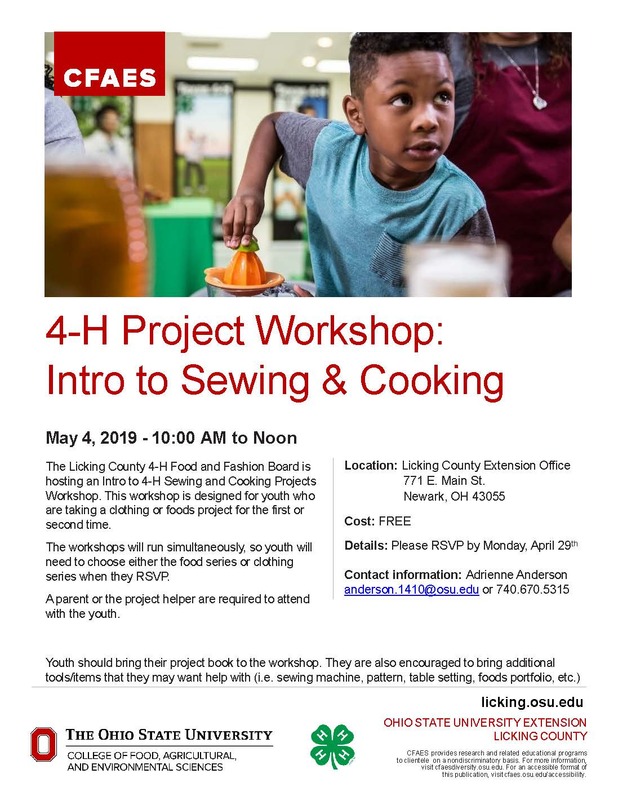 The Licking County 4-H Food & Fashion Board will be hosting workshops designed for beginning project members who are taking food or clothing projects for the first or second time. Both sessions will run simultaneously, so member will need to pick one workshop or the other. They will not be able to attend both. 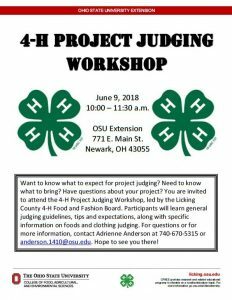 A parent or the project helper is required to attend to learn along with the 4-H member. Members should bring their project book with them, but are also encouraged to bring other items they may wish to get help with (maybe they have a sewing machine they need to know how to thread or have questions on a recipe for their foods project). Please RSVP by Monday, April 29th at 740.670.5315. More info can be found here. Please have your teen fill out the inventory and return it to our office by Friday, September 21, 2018 so that we can ensure your teen gets the information they need. Do you enjoy taking food and/or clothing projects? Do you want to share your knowledge and gain leadership skills? Do you want to meet new people and make new friends? If so, we would encourage you to apply for the Licking County 4-H Food & Fashion Board. The Food & Fashion Board is open to members ages 14 as of January 1, 2019. Members must have completed a food or clothing project in 2018 and plan to complete a food or clothing project in 2019 to be eligible for the board. Applications are due to the Licking County Extension Office by 4:30 p.m. on Friday, September 21, 2018. Interviews will be held at the Licking County Extension Office on Thursday, October 4, 2018 between 4:30 and 6:30 p.m. Once you have submitted your application, please call our office at 740.670.5315 to schedule your interview time. 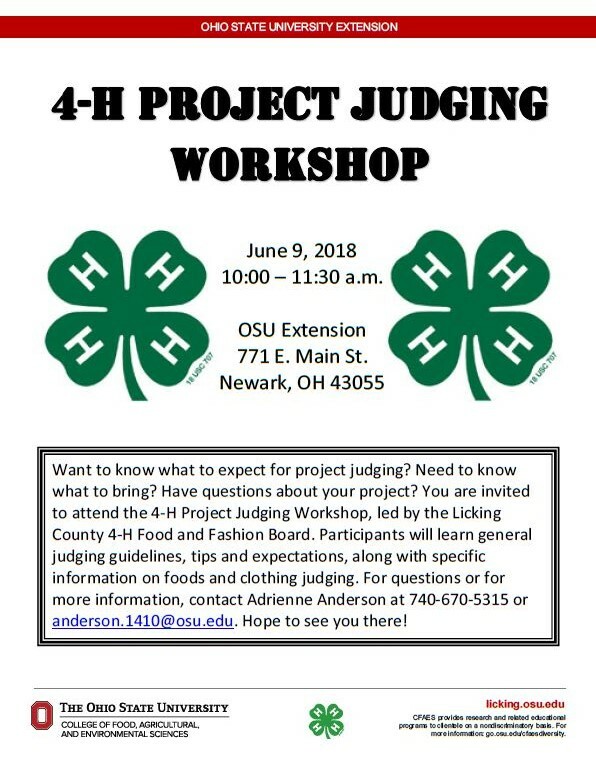 The Licking County 4-H Food and Fashion Board will be hosting a Project Judging Workshop at the Extension Office on Saturday, June 9th from 10:00-11:00 a.m. This is a great opportunity for new members to get an idea what project judging will be like as well as have their questions answered. Members will have project examples available for members to view and will be doing modeling practice for those taking clothing projects. While a large portion of the program will focus on food and clothing judging, there will also be a portion dedicated to special interest projects. REMINDER: Meat Chicken and Duck Orders Due! REMINDER: 2019 Mini Camp Registrations Due!